Beat The Winter Cold! It's Always Warm At Chula Vista In The Wisconsin Dells! Request more information and rates. 3 Bedroom Condo - Our three bedroom condo has a full kitchen, master bedroom with private master bath, living room, large hot tub, balcony and is almost 2,000 square feet. Perfect for a large family or to share with multiple families. There is sleeping space for up to 14 people with a maximum occupancy of 18. 2 Bedroom Condo - Our two bedroom condo has a full kitchen, master bedroom with private master bath, living room and large hot tub. Perfect for a large family or to share with multiple families. There is sleeping space for up to 8 people with a maximum occupancy of 10. Double Queen Junior Suite - Our junior suite has 2 queen beds, a sofa sleeper, bar area with sink, mini refrigerator, microwave and sleeps up to 6 people. Perched on the banks of the Wisconsin River all of our condos provide a scenic wooded view of the Wisconsin River. 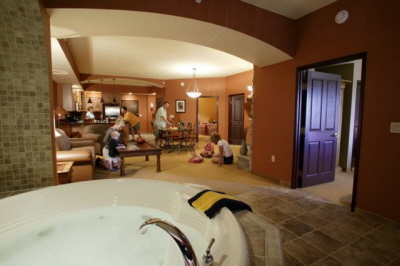 Chula Vista Resort provides one of the most complete vacation experiences in the Wisconsin Dells including one of the newest and most exciting water parks in the Wisconsin Dells all in a picturesque setting. Why spend your next Wisconsin Dells vacation next to a busy Interstate when you can enjoy the tranquility and beautiful views along the banks of the Upper Dells of the Wisconsin River? For vacation rental rates and availability or to request more information please visit our vacation rental rate request form. Click on the images below to change the image above. Our condos are located on the second floor of the main condo building at Chula Vista Resort facing the Wisconsin River. The main condo building is connected to all indoor resort amenities via indoor walkways so that you can walk to the water parks, restaurants, sports bar without having to go outside. The condo building is all concrete construction which ensures a quiet comfortable stay and will feel like your home away from home. Our three bedroom condo and two bedroom condo include a full kitchen with granite counter tops, oven, microwave and full sized refrigerator so that you can save on meals by bringing your own food to prepare instead of dining out or ordering room service. All guests staying in our condominiums have full access to the indoor water park, outdoor water park and wave pool all day from the day of your arrival through the day of your departure. If you are considering a stay in our 3 bedroom condo or just want more information, please contact us today for discounted condo rental rates. For more information and to see all that the resort has to offer, watch the Chula Vista Resort video. Contact us today for discounted condo rental rates on 3 bedroom vacation condominiums.